Madame Germaine de Stael is often regarded as the "mistress to an age", or (like England and Russia) one of the three great European "powers" of the 19th century. She was in some sense both, but she was also an important and influential writer whose works, astonishingly, have not, until this volume, been translated into English since the early 19th century. She absorbed the leading ideas of the Enlightenment on literature, politics, science and the social order; turned many of them to her own uses and then bequeathed them to the 19th century, which adopted much of the Enlightenment through her works. 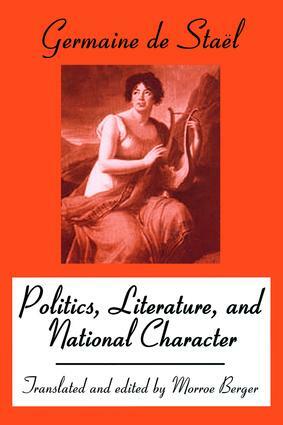 She had two related aims: by her writings on politics, to guide Europe as it entered the republican era and to help it maintain its cultural legacy and liberty; and to explain all literature by its relation to social institutions (which has had a profound effect on all subsequent studies of comparative literature). Here, in clear and flowing English prose that conveys both the personality and the style of the original - and that corrects the errors of earlier translations - are selections from Madame Germaine de Stael's major works, including "Considerations on the Principal Events of the French Revolution", "Literature Considered in its Relation to Social Institutions", "Essay on Fiction", "On Germany" and her reflections on Russian and English as well as German national character. They make plain both her amazing modern approach to such subjects as politics, literature, science, education and women, and the tremendous repercussions her work has had.